we have provided Kirkland for over 25 years. took great care of me. Dr. Everett does a great job." " The staff there are all SO friendly and knowledgeable, and always make me feel at ease. I HIGHLY recommend this place! " " Great service and the staff is very friendly and helpful. Highly recommended! " Thank you for visiting Kirkland Family Dentistry. We are proud to be the leading Kirkland dental office as voted by Kirkland residents, serving the area for over 25 years and counting. At Kirkland Family Dentistry we are committed to working with you and your family to give you the best dental health care available at affordable prices. We offer top of the line services dental health services to help you obtain the perfect smile you have always wanted. At Kirkland Family Dentistry our patients come first, for that reason we are offering free in office teeth whitening for new patients. We would love the opportunity to get to know you and come up with a personalized dental plan to fit your individual needs. Our highly trained staff is here to help make your visit as comfortable and enjoyable as possible. "Been going here for 10 years & it's the best dentist office I've gone to. Excellent service--friendly & knowledgable staff, easy scheduling." "Unfailingly professional. Excellent and affordable." "Great job! They got me in extremely quick (I had a broken crown), and took care of my problem immediately. I highly recommend this staff and their work!" "Dr. Greene's office is the best. Staff is courteous and always on time!" "Amazing! So friendly and professional! Always very accommodating." 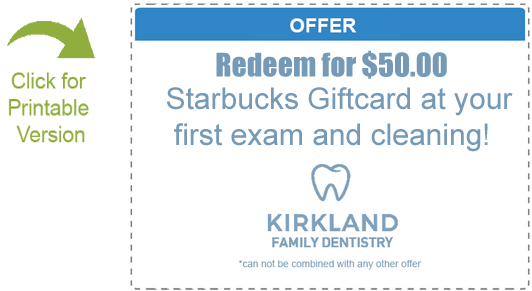 "Love Kirkland family dentistry! They always take the time to address all my oral problems. Fun atmosphere and very friendly staff. I would recommend KFD to all my family and friends! I will be a forever patient here." "Dr. Everett is awesome! I came in for a cleaning and was very impressed with the quality of care. Would highly recommend this office to anyone!" "Dr Greene is always on time. He has a gentle touch. He cares about his patients. The whole staff is committed to positive experiences and results. If you from out of town or looking for a new dentist please use Dr Greene. There is no one better." "Once you walk in the doors you are greeted right away and everything is clean and very professional. All of the staff is really nice and you are always treated with great quality, care, and respect. I highly recommend this place!" "Just the best! The entire staff is so smart, friendly and flexible! Their front office is warm and welcoming. The tech's are knowledgeable, and experienced. And Dr. Green is a Professional. A solid business with world class service." "Great friendly staff. Julie has done my cleaning for the last 2 years and it is always a pleasent experience. Dr. Greene has always treated me great. Such a relief to find a great practice. Thanks Doc and staff!!!!" A high-quality, comprehensive Kirkland dental practice that can take care of the whole family's dental health. A cosmetic Kirkland dental practice that specializes in unique and high-end esthetic cases. A provider of personalized dental care with the best materials available. Check out what some of our awesome dental patients have to say. 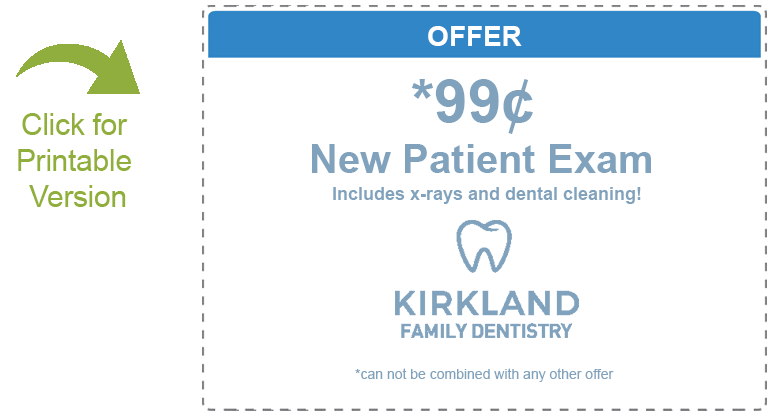 "Dentistry doesn't get better than kirkland family dentistry. Dr. Greene and his staff(especially the receptionist Sherri) are top notch and professional all the time. Highly recommended!" "I've been going to Kirkland Family Dentistry for over 15 years! Wouldn't go anywhere else. Great, friendly staff-Sherri, Karen and Julie make going to the dentist a little bit easier. Thanks!" "I've been going here for a few years and I love them so much. The staff is amazing and very friendly. Definitely recommend to anyone who is looking for a dentist." "We love everyone at Kirkland Family! Always so friendly & great with my kids. They've always been able to get me & the kids in at the same time which is a HUGE timesaver for me ? Great people, great service & great care for all of us!" "This review is probably long overdue. I have been coming here for almost 7 years and have always felt I received exceptional care. Not to mention the staff is always friendly! I am not a big fan of the dentist ... But if I have to go this is the best place to be!" "Kirkland Family Dentistry has been my dentist for almost 10 years now. All the assistants are friendly, professional and knowledgeable. I am always comfortable whenever I walk in their door." I've been a patient here for 20 years and could not be more happy with their work and experience. Dr Greene and staff are knowledgeable and understanding of patient comfort that shows from years of experience. I work in the dental industry and can see the difference in how they operate and care for patients (who become more like friends). Thank you Kirkland Family Dentistry! Is it crazy that I love coming to get my teeth cleaned? I have been a client of Kirkland Family Dentistry for 4 years and I have not only received amazing dental care, but I have changed my personal care habits as well! Every time I come in I am greeted with big smiles from Sherri and the awesome team up front. They really make me feel appreciated! I have been seeing Julie for 4 years and she has been fun, professional and extremely knowledgeable! I have adopted flossing and brushing twice daily per Julie's orders and I always look forward to coming back to see the crew! Good job team! I had a dental phobia and have a hard time finding a dental practice that will take time with me . I have been so happy with the quality of care they have given me and my family!!! I love the same day treatment along with giving you detailed instructions on how to care for your dental work you had done. If you have a question they will answer your question, with having you come back into the office to adjust what is bothering you.